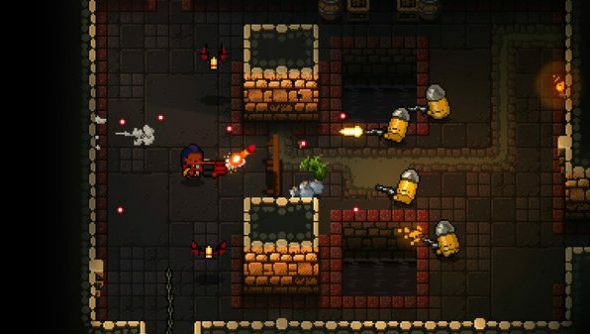 Enter the Gungeon developer Dodge Roll Games have announced that Enter the Gungeon has surpassed 200,000 copies in its first week on sale. If you’re looking for more small studio fun, why not check out our list of PC’s best indie games. Steam Spy currently shows the roguelike as having 170,000 owners which, if accurate, suggests three quarters of the game’s sales come from PC, with the rest on PlayStation 4. Sales have been climbing quickly, as is apparent fromCosmic Star Heroine developer Robert Boyd’s tweet with the data from two days ago. “SteamSpy indie hit update: Hyper Light Drifter (88k), Enter the Gungeon (131k), Stardew Valley (915k), Undertale (1.4 mil),” wrote Boyd. SteamSpy indie hit update: Hyper Light Drifter (88k), Enter the Gungeon (131k), Stardew Valley (915k), Undertale (1.4 mil). That means it’s sold 40k more copies in the past couple of days, despite the healthy indie competition. A lot of this is clearly down to the game’s quality, but it’s likely some savvy marketing based around Twitch streamers in the lead up to release also played a part. Enter the Gungeondebuted on April 5 and is available on Steam now for $14.99.